A picture's worth a thousand words,so here's a few pictures and not too much waffle. 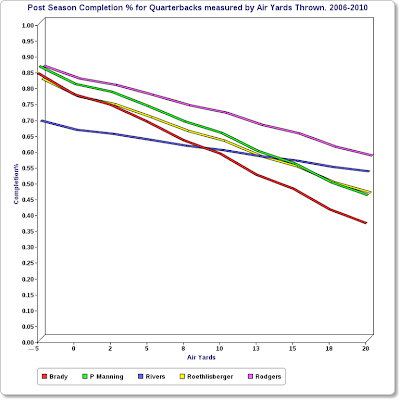 I've looked at every individual passing attempt by every quarterback in the playoffs since 2006 and I've noted both the distance traveled by the ball through the air and if the pass was completed or not. 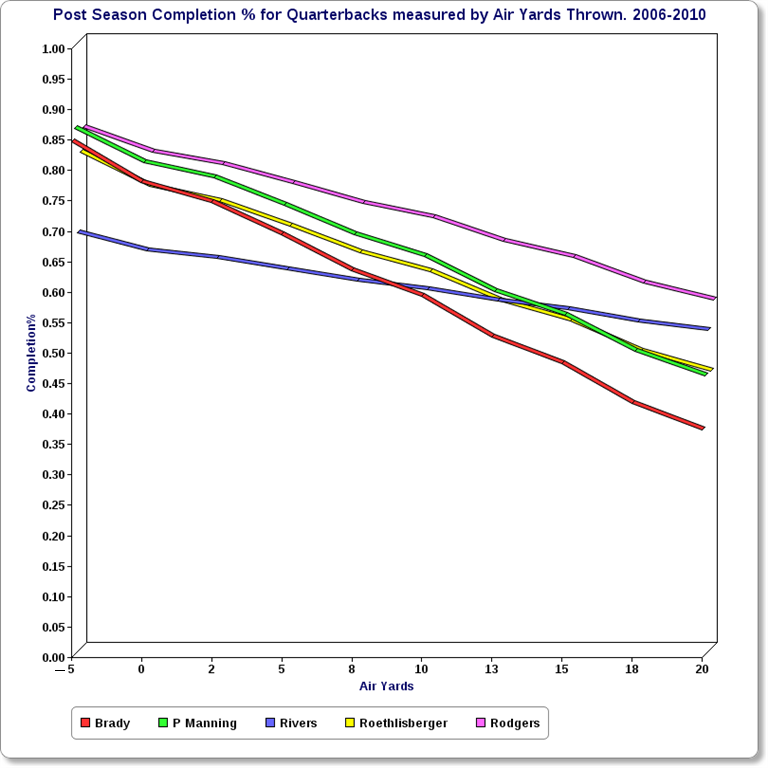 I've then produced a regression equation for air yards thrown and completion rate and plotted this curve for every post season quarterback. Below is a plot for five of the most prominent passers over the period. To illustrate how to use the graph when passing to targets five yards behind the line of scrimmage, Brady, Manning(P), Roethlisberger and Rodgers are all completing at around 85%, while Rivers is down around 70%. Quarterbacks are only half the story from a team perspective, so for the next graph I've plotted the regression for every post season pass defended by their defense. 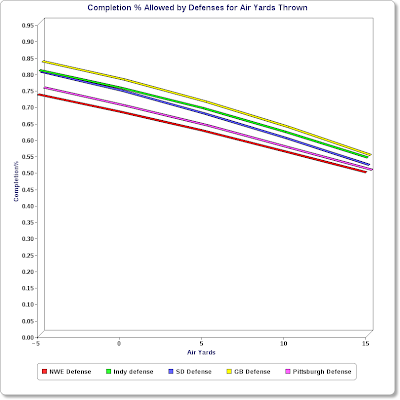 This time the lower the completion rate then the more impressive the performance by the defense. Of the five Green Bay has been the least impressive over the period, allowing higher completion rates than all of the other four teams. NWE have been consistently the best. The final graph is an ad hoc attempt to combine the previous two graphs. 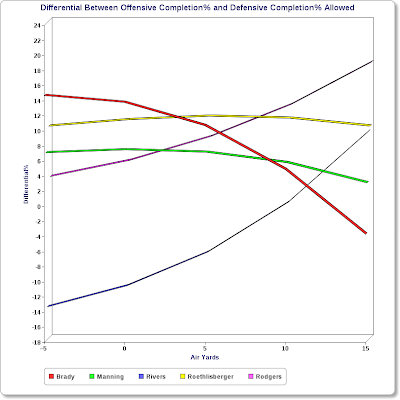 To illustrate, Tom Brady has completed around 85% of passes thrown to a receiver five yards behind the line, while his defense has allowed just 74% completions on such passes, therefore NWE are performing around 15% better in such circumstances than their opponents. By contrast San Diego underperformed their opponents in those type of throws by around 13%. 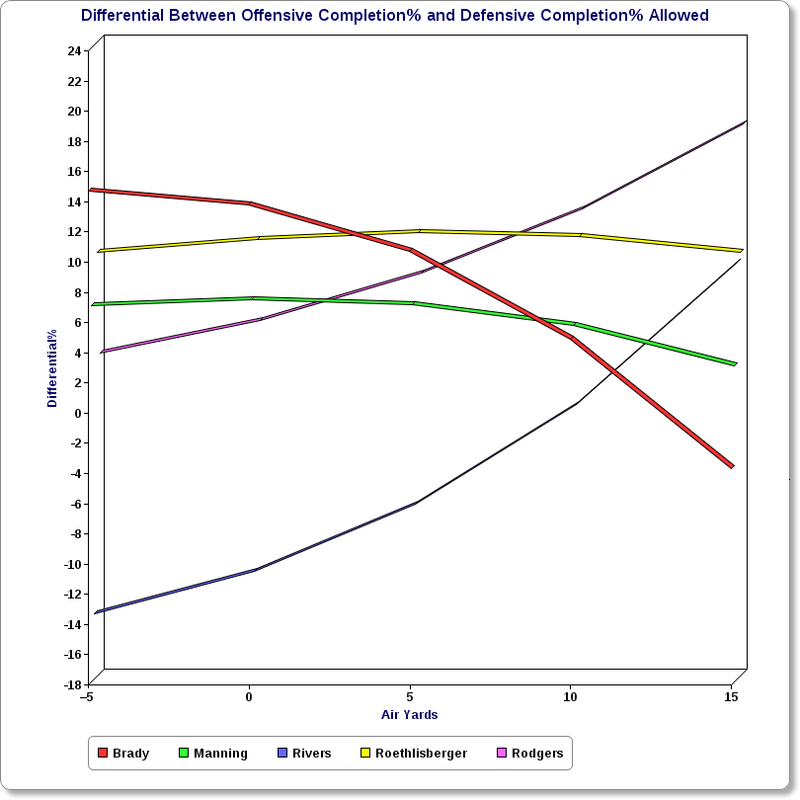 The graph is labeled "Brady"etc, but it could equally be labeled "NWE"
Higher completion rates in relation to those of your opponents over shortish distances would appear to be an important factor in stringing consecutive wins together, thus leading to post season success. Brady, Roethlisberger, Manning and Rodgers have along with their respective defenses dominated opponents in short passing situations. The average post season scoring drive requires on average between three and four first downs and doing well when completing short passes combined with the subsequent yards after the catch appears to give teams the upper hand in moving the chains. Rivers appears to struggle to consistently hit these passes in the post season and together with the Chargers defense being no more than average at preventing short completions, SD have yet to string enough post season wins together to make the final game.